In early 1643, the Spanish launched an invasion of northern France with the goal of relieving pressure on Catalonia and Franche-Comté. Led by General Francisco de Melo, the mixed army of Spanish and Imperial troops crossed the border from Flanders and moved through the Ardennes. Arriving at the fortified town of Rocroi, de Melo laid siege. In an effort to block the Spanish advance, the 21-year old Duc de d'Enghien (later the Prince of Conde), moved north with 23,000 men. Receiving word that de Melo was at Rocroi, d'Enghien moved to attack before the Spanish could be reinforced. Approaching Rocroi, d'Enghien was surprised to find that the roads to the town were not defended. Moving through a narrow defile flanked by woods and marsh, he deployed his army on a ridge overlooking the town with his infantry in the center and cavalry on the flanks. Seeing the French nearing, de Melo formed up his army in a similar fashion between the ridge and Rocroi. After camping overnight in their positions, the battle began early on the morning of May 19, 1643. Moving to strike the first blow, d'Enghien advanced his infantry and the cavalry on his right. As the fighting began, the Spanish infantry, fighting in their traditional tercio (square) formations gained the upper hand. On the French left, the cavalry, despite d'Enghien's orders to hold their position charged forward. Slowed by soft, marshy ground, the French cavalry's charge was defeated by the German cavalry of Grafen von Isenburg. Counterattacking, Isenburg was able to drive the French horsemen from the field and then moved to assault the French infantry. This strike was blunted by the French infantry reserve which moved forward to meet the Germans. While the battle was going poorly on the left and center, d'Enghien was able to achieve success on the right. 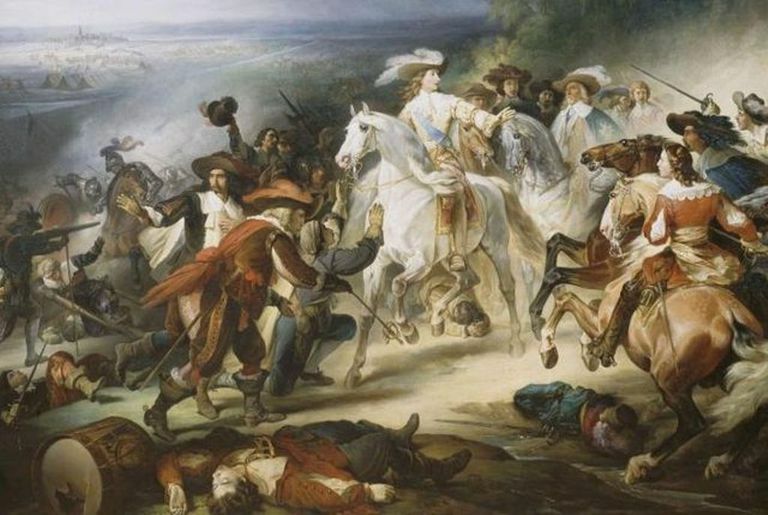 Pushing Jean de Gassion's cavalry forward, with support from musketeers, d'Enghien was able to rout the opposing Spanish cavalry. With the Spanish horsemen swept from the field, d'Enghien wheeled Gassion's cavalry around and had them strike the flank and rear of de Melo's infantry. Charging into the ranks of German and Walloon infantry, Gassion's men were able to force them to retreat. As Gassion was attacking, the infantry reserve was able to break Isenburg's assault, compelling him to retire. Having gained the upper hand, by 8:00 AM d'Enghien was able to reduce de Melo's army to its vaunted Spanish tercios. Surrounding the Spanish, d'Enghien pummeled them with artillery and launched four cavalry charges but was unable to break their formation. Two hours later, d'Enghien offered the remaining Spanish terms of surrender similar to those given to a besieged garrison. These were accepted and the Spanish were permitted to depart the field with their colors and weapons. The Battle of Rocroi cost d'Enghien around 4,000 dead and wounded. Spanish losses were much higher with 7,000 dead and wounded as well as 8,000 captured. The French victory at Rocroi marked the first time the Spanish had been defeated in a major land battle in nearly a century. Though they had failed to crack, the battle also marked the beginning of the end for the Spanish tercio as a favored fighting formation. After Rocroi and the Battle of the Dunes (1658), armies began shifting to more linear formations. What Was the Battle of Nancy?